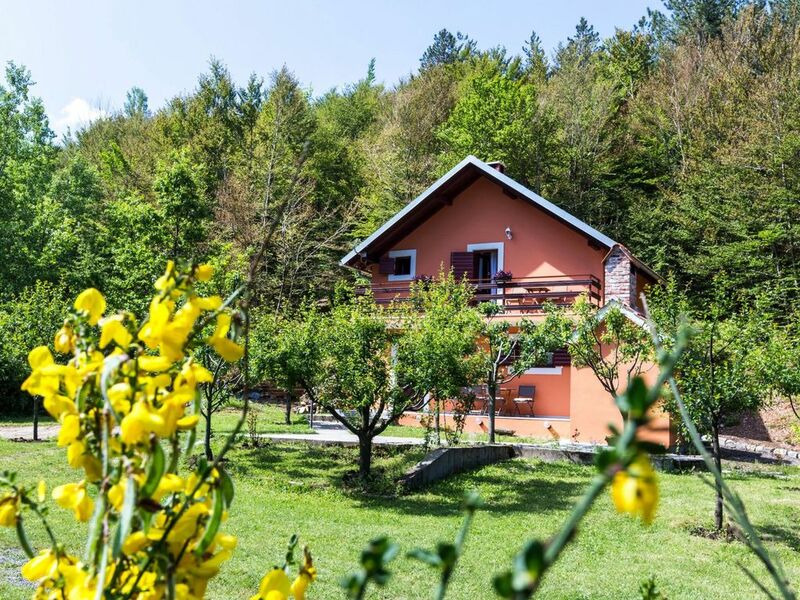 Ričice 15 km from Lovinac: Single-family house "Forest Escape", 2 storeys. In a quiet, sunny position, 50 km from the sea, 2 km from the lake, in the countryside. Private: property 350 m2. Garden furniture, barbecue. In the house: washing machine. Parking (for 2 cars) at the house on the premises. Shop 3.5 km, restaurant 3.5 km, pebble beach 50 km. Cycle lane 600 m. Nearby attractions: NP Paklenica 70 km, Memorial Center 55 km, rafting Zrmanja 54 km, Adventure park 50 km, NP Plitvice 70 km. Heating (extra) available only in the period 08.09.2018.-24.05.2019., 07.09.-29.11.2019. 3-room house 80 m2 on 2 levels, north facing position. Living/dining room 26 m2 with satellite TV and wood-burning stove. Open kitchen (oven, 4 ceramic glass hob hotplates, electric coffee machine). Wood heating (extra). Upper floor: entrance hall with air conditioning. 1 room with 3 beds (90 cm, length 200 cm). 1 room with 2 beds (90 cm, length 200 cm). Exit to the balcony. Shower/WC. Forced-air heating (extra). Balcony 7 m2, terrace 14 m2 partly roofed. Terrace furniture. View of the countryside. Facilities: safe, hair dryer. 1 pet/ dog allowed.